Nexgen is a family-owned HVAC company in Anaheim. We are Google Certified for home services and all of our Nexgen employees are background checked and verified. Whether you’re in need of AC maintenance, heating installation, or furnace repair, you can call on NexGen for the best HVAC company in Anaheim. We tackle all types of heating and cooling services for our customers. You can count on us for top-notch service paired with excellent customer support. As a family owned and operated company, we care about the level of service and support we provide our customers. That’s why our HVAC services are backed by our thousands of 5-star reviews from satisfied customers and numerous Yelp awards over the years. When you need expertise you can rely on, trust the job to our Trane-certified HVAC technicians. We work closely with our customers to ensure they get the personalized heating and cooling services they deserve. From high tech thermostats to air conditioning tune-ups, we make sure to prioritize your comfort and convenience every step of the way. Home comfort is a big deal for most families. Spending a majority of your downtime at home, you likely want to ensure your cooling system is doing its job efficiently and effectively -- not costing you extra out of pocket. Nexgen is your solution for reliable air conditioning services ranging from repairs to seasonal maintenance to thermostat control and more. AC installation - Nexgen offers a broad range of air conditioning units, including ductless mini splits, central air conditioning systems, window units, and more. We’ll help you decide which options make the most sense for your cooling needs. AC repair - Our Anaheim AC repair technicians have helped countless homeowners get their cooling systems up and running in no time at all. You can trust even the most complicated air conditioning concerns to us with confidence! AC maintenance - Especially before the summer heat sets in, you’ll want to have your air conditioner inspected and tuned up. This allows you to have peace of mind when you need it most. Leave your AC unit in the hands of the expert technicians here at Nexgen! We’ll make sure your unit is performing at top efficiency. Smart home services - Want to make your home HVAC system even more efficient? Considering upgrading your thermostat to a Nest for optimal control over your cooling and heating usage. We can help you elevate your house to be a fully innovative smart home, complete with everything from security cameras to smoke detection to thermostat control. Nexgen offers air conditioning installation services in Anaheim, CA. We carry two of the most popular HVAC products, Trane and Lennox, to help meet the unique needs of our customers. Ductless Mini-Split: Feature compact and highly-efficient units that reduce utility costs by cooling separate zones within the building. Central AC Units: Comprises of a central unit installed outside the home or business with ductwork that delivers cool air throughout the interior. Heat Pumps: Removes heat from the home and transfers it outside. Because it moves heat rather than generate it, heat pumps are more energy efficient. Window AC Units: Compact and portable ac units making them a good choice for people who are renting. Package Units: These can be customized to meet a customer’s unique cooling and budget needs. Nexgen also provides air conditioning maintenance and AC repair services to homeowners in Anaheim, CA. Air conditioning maintenance will provide efficient and effective cooling services to your Southern California residence. Enjoy benefits like lower energy bills, fewer repairs and a longer lasting system with regular AC maintenance in Anaheim, CA. Lack of power to the AC system and limited airflow are some of the most common reasons to contact a HVAC technician for AC repair in Anaheim, CA. However, if your AC unit is over 20 years old, it may be time for a replacement. To discuss if you need an Air Conditioning replacement or an Air Conditioning repair in Anaheim, CA, please contact Nexgen today! Heater repair & maintenance - When you’re frustrated with your heater not performing efficiently or can’t seem to get your furnace working correctly, it’s time to call on Nexgen. We are available 24/7 to help with any heating repair emergency or just regular maintenance whenever you need. Heater installation - Time to upgrade to a new heater? We are proud to offer all types of heating units from trusted brands Trane and Lennox. Whether you’re deciding between a heat pump and a furnace, we can help you get the right unit installed in your home. Water heater installation - We offer cutting-edge solutions for your water heater needs, including tankless water heaters. We’ll review your options and help you decide on the best type of water heater for your home size and budget. Furnace – is available in electric, oil and gas versions to better meet a customer’s needs. Heat Pumps – transfer heat from its source to deliver it efficiently throughout the building. Package Units – Often referred to as “roof top units”, these are generally installed on flat roofs using exposed ductwork. In addition to heater installation in Anaheim, Nexgen also provides maintenance and heating repair services for a variety of heating systems. Temperature fluctuations, low air pressure and increased costs are some of the biggest reasons for heating repairs in Anaheim. If you find that you are conducting repairs frequently, it is probably time for a heater replacement. If you notice any of these problems, contact an HVAC repair technician to find a effective and affordable solution. Even if you upgraded to a top-of-the-line HVAC system, without quality home insulation, you could still be dealing with inefficient heating and cooling. That’s why proper home insulation is so important. Nexgen can help you save on your monthly utility bills by improving your home insulation, helping you stay cool in the summer and cozy during the winter time. By adding more insulation to those exterior walls, your home can be set up to have more moderate temperatures, cause fewer fluctuations and providing more consistency year-round. Similarly, insulating crawl spaces can help improve floor warmth and attic insulation can help better regulate indoor temperatures, preventing cool air from escaping in the warmer months and warm air from being released when you need it during chillier days. In addition to that, having proper air duct insulation can also play a part in improving indoor air quality by keeping out unwanted airborne particles and preventing circulation throughout your house. A properly insulated home or business helps reduce energy usage and utility bills without compromising comfort. Attic Insulation – addresses the number one location where homes experience energy loss. Duct Insulation – is often a forgotten issue that, when properly completed, can make the existing HVAC system more efficient. Crawl Space Insulation – helps reduce the gaps can result in an increase in utility usage and bills. Exterior Wall Insulation – is blown or sprayed in between the siding or other existing exterior material of the home to increase its energy efficiency. Often something that homeowners don’t think about until an issue arises. 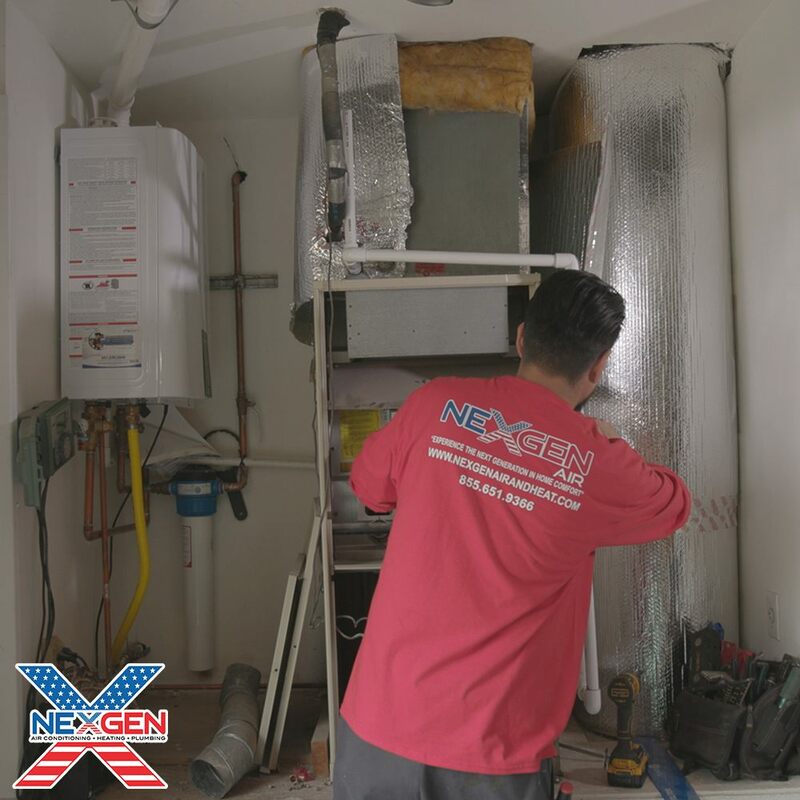 Nexgen provides efficient and professional hot water heater installation and repairs to residents in Anaheim, CA. Conventional Storage Tanks – can be gas or electric and are available in a range of sizes. Tankless Water Heaters – are the ideal solution for homes that need quick access to hot water. You deserve to be able to breathe clean air in your own home, which is why Nexgen is here to provide the indoor air quality services you need. We are dedicated to giving our customers comfortable and healthy indoor living environments. Did you know that poor indoor air quality can lead to difficulty breathing, irritation to the eyes, dizziness, fatigue, and other more serious health risks? Some homes may suffer poor air quality due to asbestos, gas emissions, dust, mold, pollen, pet dander, toxic spores, and other threats. Our team can do everything from sealing air ducts to prevent harmful airborne particles from invading and contaminating your home to cleaning ducts and installing a whole-house air purification system. The air that’s inside a building can contain harmful particles. Maintaining the quality of the interior air relies on cleaning and maintaining the air ducts. Indoor air quality testing is vital to protecting the health of the home’s occupants. Air Duct Cleaning – Removes pollutants, allergens and more from the system that delivers warm and cool air to the home. Air Duct Sealing – Helps keep harmful particles out of the ducts and reduce energy loss. Air duct insulation can also make air ducts more energy efficient. Are you in need of heating, cooling, or indoor air quality services? Nexgen is happy to offer reliable services that are available around-the-clock for our customers. We provide multiple financing options to keep our solutions accessible, free upfront estimates, and give our customers the peace of mind they deserve with our thorough warranties. We know you can’t always plan for water heater issues or AC breakdowns, which is why our Anaheim HVAC technicians are ready for emergency services when you need us most. Nexgen is driven to provide customers with more than just a comfortable home, but a safe one as well. When you reach out to our company, you can be confident in knowing you’ll get top quality services paired with conscious solutions. More than 17,950 customers chose to trust their home HVAC services to Nexgen last year -- join the ranks of happy customers today when you call on us!